The Washington Post has an interesting, long article about Google's project to scan every book on Earth. The article mentions a 2002 meeting put together by Paul Allen, co-founder of Microsoft, about the creation of a Final Encyclopedia. The head librarian of Stanford met Larry Page and Sergey Brin at this meeting, which led a couple of years later to the announcement of Google's scanning project. When Google's project was announced, I immediately thought "aha, clearly it's The Final Encyclopedia!" It's funny to learn now that this was what all the decision-makers were thinking about as well. A bit of background. 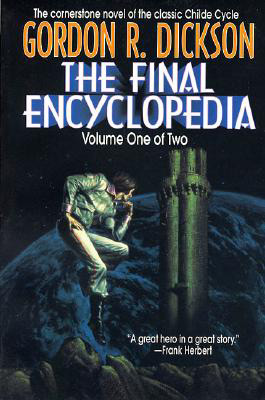 The Final Encyclopedia is a classic science fiction book by Gordon Dickson in his Childe Cycle. The book was first published in 1985. As you can see from the above cover of the book, the Final Encyclopedia is a very large Earth orbital structure (1,600 km altitude). It holds all of human knowledge. Of course, it bears no resemblance to Google's current server farms on terra firma. But it's astonishing to see how quickly the idea is becoming reality. Later in the article, the writer suggests that this project will end up being bad publicity for Google -- that Google is somehow going against its "don't be evil" ethos. Frankly, I find this idea ridiculous. Google got a ton of good publicity out of the project. It's a mind-blowingly awesome idea. Also, the writer suggests that the book publishers association filed suit against Google on the project in order to bring Google to negotiating table. I agree that this is part of the reason for the suit, but Google rightly is confident that it will win the suit. Why are the publishers getting into a suit that they are likely to lose? I think that the publishers were trying to make potential Google partners uncertain about the legal risks involved, and thereby slow the project. But it doesn't seem to have scared away the University of California system, which signed on to the project last week. It has 34 million books in its stacks. In any event, I'm happy that the trucks filled with books from Stanford University are still pulling up to an undisclosed area of the Googleplex for scanning. Last week, Google announced its 2nd quarter results, which contained a line item of about $700 million for capital spending, including about $320 million for real estate purchases in Mountain View, California, its headquarters. $700 million in capital spending represents a 342% increase from the 2nd quarter 2005. This capital spending pace is well ahead of the $1.8 billion for 2006 that I calculated only a couple of months ago. Compare to other capital spending behemoths like Comcast (cable TV) with about $1 billion in quarterly capital spending and Verizon (phone) with about $4 billion in quarterly capital spending. As stated in that prior post on the subject, Google is slightly different than these companies because Google has an international footprint while cable and phone are domestic industries, but it's breathtaking to see how large of a player Google has become in only 8 years of operations. First there was maps.google.com, then moon.google.com. Now we have mars.google.com, which is much more detailed than the moon site. Elevation, visible spectrum, and the infrared spectrum are covered. If you have broadband, check it out. Google comes out with some very cool visualization tools. While surfing Bigelow Aerospace's web site this morning, I noted that the jobs page has been updated extensively again. Bigelow has a big blurb in bold about wanting to hire recent engineering grads. No full-time job experience is required, so if you fit the bill, this is a good opportunity to get in on the ground floor with a company doing some of the most exciting work in aerospace with your work making it to space on short order. These opportunities are rare in aerospace, unfortunately. Also of note is that Bigelow has posted a job description for a web designer. 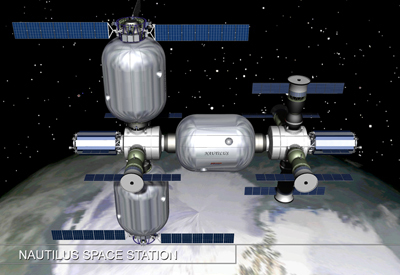 Bigelow's web site looks amateurish, but it seems like a slam dunk to use all of the good space artwork that Bigelow has commissioned in order to make a polished web site. If you are looking for good web design work, you would be doing all of us fanboys a favor by taking on the assignment. What Have They Done with the Real Google? Google Blogoscoped shows a simple test to demonstrate how evil the new google.censored service is. Here's an images.google.com query for "tiananmen" and here's an images.google.censored version of the same query. This whole issue sticks in my craw badly. I'll have much more to say about this some other time. The Google Video store launched yesterday, and I've been playing around with it a little. The content is getting better every day. For instance, it appears that The Charlie Rose Show is addding a couple hundred previously-broadcast hourly interviews a day. I use my Digital Video Recorder (DVR) to record current shows, but, when complete, the store will contain more than a decade of the interviews on demand -- thousands of hours of video -- at a reasonable price of $1 per hour. However, besides having a large amount of content and a well thought-out concept of keeping content-owners happy (variable pricing, easy uploading, free bandwidth, etc. ), the store and video player -- what Google's customers are to use -- are disappointingly "beta." In the store, you can't sort the videos by original broadcast date and therefore can't find the latest shows. The video player is very basic. If you are used to a full-featured media player, such as Zoom Player Professional, likely you will wonder why Google discarded years of thoughtful work by the A/V community. Perhaps Google has already implemented all of these options as an automatic thing rather than an explicit option, but there is no indication of this. I have not had a chance to test fully the quality of the video, but what I have seen is low quality. HDNet has a couple of free clips on Google Video that Google has down-rez'd from beautiful high definition to what looks like ugly 480i. This is disappointing, considering that you already can download some programs in high definition from the HDNet web site through a small peer-to-peer applet (3.8 megabits per second consistent downloads). There do not appear to be options for a trade-off between available bandwidth, resolution, and how long the viewer is willing to wait for the program to download. For instance, I have a 8 megabit/second broadband connection, and I would like high definition video when available, so would be willing to wait a while for the program to download. Overall, this appears to be the first Google "me-too" product. In short, so far, it's uninspired. Why is Google spending money on VOIP keyword? As we all know, Google doesn't spend any money in advertising, but relies on word-of-mouth instead to get the message out. However, Google forgoes potential money by "buying" some adwords on its own search engine. For instance, type in "e-mail" and the first paid result links to Gmail. There are lots of other fun tests, such as searching for "web search" (no Google ad), and "news" (Google News is the first paid result). Surprisingly, this internal subsidization extends to what I would believe to be a lucrative keyword: "VOIP", which stands for Voice-Over-Internet-Protocol, or making phone calls over the internet. Google Talk, which is a very modest VOIP tool that I use right now, is listed 6th in the paid results on the right-hand side. I suspect that this real estate is worth quite a bit, which means that Google is investing a lot of money in the service beyond the costs to develop the application. While recently I stated that eBay vastly overpaid for Skype, a more full-service VOIP application, Google's internal subsidization of its Google Talk product puts the Skype investment in context. Google is willing to spend a lot of money to expand in the VOIP business, which is some measure of its ambitions in the area.